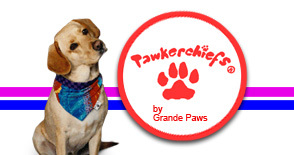 Pawkwilts© from Grande Paws, the makers of Pawkerchiefs® are unique quilted blankets for dogs and cats. Each are made in three layers. 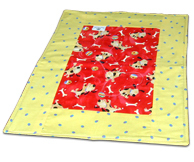 The top layer is hand-pieced 100% cotton in bright, colorful dog or cat motifs. The middle is polyester fleece for cushion and the back is a matching color of brushed cotton chamois for warmth and comfort. Pawkwilts© come in three sizes: small, medium and large. Please click on the "BUY ME" button at right to see and choose the Pawkwilts© that's right for your little one.